Jersey Shore Boca U23 standout and TCNJ senior defender Courtney Krol was named a third team All-America by the National Soccer Coaches Association of America (NSCAA). Krol was a member of the inaugural Boca U23 women’s team last summer that advanced to the Mid-Atlantic Summer Showcase League Championship Cup finals. TOMS RIVER, NJ (December 28, 2007) – Jersey Shore Boca U23 standout and College of New Jersey Senior defender Courtney Krol (Howell) was named a third team All-America by the National Soccer Coaches Association of America (NSCAA). It makes the second straight year Krol has been honored as Krol was named to the All-American first team one year ago. The Howell Township native was also named to the NSCAA Mid-Atlantic First Team and was the 2007 New Jersey Athletic Conference (NLAC) Defensive Player of the Year marking the third straight year she has claimed that award and was All-NJAC First Team. Krol contributed at both ends of the field for TCNJ scoring four goals and adding seven assists, while anchoring a defensive unit that has allowed only six goals in 22 games with 18 shutouts. The Lions ranked first nationally in goals-against-average at 0.257. In addition to her success on the field, Krol was also CoSIDA ESPN The Magazine Academic All-District II College Division Second Team. Krol helped TCNJ finished the 2007 campaign with a 21-1-1 record while also advancing to the NCAA Division III semifinals for the third straight season. TCNJ also won its third straight NJAC Championships winning the conference tournament following an 8-0-1 conference mark during the regular season. 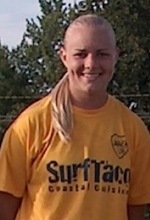 Krol was a member of the inaugural Jersey Shore Boca U23 women’s team last summer that advanced to the Mid-Atlantic Summer Showcase League (MSSL) Champion Cup finals. Sixty-seven Jersey Shore Boca standouts who previously played for the Club on either their Men’s, Women’s, Super Y-League, PDL, Club or Youth teams, participated in NCAA intercollegiate soccer during 2007 representing their respective institutions as players and coaches in some of the top college soccer programs in the nation. The sixty-seven mark the highest number ever of Jersey Shore Boca players and coaches to participate in NCAA intercollegiate soccer during the same season in the Club’s twenty-nine year history.